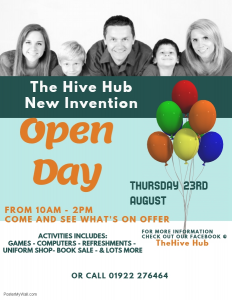 Frank F Harrison Community Association invite you to an Open Day at New Invention Community Hub on Thursday 23rd August 2018 from 10am to 2pm. It’s based in the former New Invention Library on The Square, Lichfield Road. There has been a brilliant response from parents whose children attend local schools to support The Hive Uniform Box school uniform recycling project. As a result there is now a wide range of both new and pre used uniforms for sale at bargain prices. The Loft Youth Club operating from the first floor of the building has been a huge success with young people and parents in the area since its launch back in April . Now The Hive is launching a full programme of activities planned for September and would be delighted to show you around if you are able to pop in on Thursday for the Open Day. The Hive Hub is open Monday to Thursday 9am to 4pm so please drop by anytime check it out and see for yourself.